Greetings Casual Runners and trivia aficionados! OK, we are willing to admit it when we are wrong about something. We may have underestimated just how much the Casual Running community loves trivia. (And here we thought that we were all just addicted to running and obsessed about shiny metal objects!). Jennifer was really on to something when she brought back the clues and solutions from the 2015 runDisney Everest Challenge to share with you all. The response to that feature was so strong that we decided to launch our own Casual Running trivia challenge. You all loved that one so much that we brought it back. Here is how this is going to work. This is your chance to test just how much you know about Casual Running.We assembled 10 Casual Running-related trivia questions. Some of the questions are challenging, but hey, so is everything that is worth doing. (Quick editor’s note: while we were writing these, Nick suggested that it might be too easy, so if we went to far the other way, you can send your emails to him!). Below each question is the answer to it, so be careful not to scroll down too far if you do not want any spoilers. You are on the honor system here, so keep track of how you do and feel free to share your results with other Casual Runners in the comment area below, or with us via Facebook, Twitter, or Instagram. But be warned, we are calling this a “challenge” for a reason! Good luck to you, now let the Casual Runner trivia challenge begin! 1) How many Americans have won the Olympic Marathon? 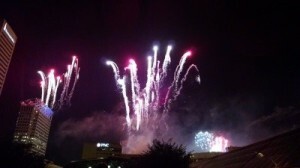 No kidding, we included this picture simply because we all REALLY like fireworks. 4. Thomas Hicks (1904 – St. Louis), John Hayes (1908 – London, declared the champion following the disqualification of the initial winner), Frank Shorter (1972 – Munich, Shorter was actually born in Munich, the site of his Olympic glory! ), and 1 woman, Joan Benoit who won the first women’s Olympic marathon (1984 – Los Angeles). 2) Staying on the Olympics for a moment, which country has hosted more Olympic Games (Summer and Winter), than any other country? The United States. The U.S. hosted 8 Olympic Games in total, including 4 Summer Olympic Games (1904 St. Louis, 1932 Los Angeles, 1984 Los Angeles, and 1996 Atlanta) and 4 Winter Olympic Games (1932 Lake Placid, 1960 Squaw Valley, 1980 Lake Placid, and 2002 Salt Lake City). Extra trivia for you: Walt Disney (yes, THE Walt Disney) played a large role in developing the artistic and ceremonial portions of the 1960 Squaw Valley Games. Mike promises he has some great factoids about that, if you want to know, just ask him, we’re sure he’s dying to share them. France, the home of modern Olympic founder Barron Pierre de Coubertin is second, having hosted the Olympics 5 times, and Italy, Japan, Canada, Germany, and the United Kingdom have each hosted three Olympic Games. However, Japan will be moving up on the list when Tokyo hosts the Summer Olympics for the second time in 2020. 3) The pinnacle annual event for triathlons is the Ironman World Championship. In which U.S. state is this annual event held? Hawaii. Hawaii has played host to this amazing test of endurance every year since 1978, and it usually takes place in the fall, though it did take place in the spring during its early years. 4) Endurance athletes from the United States have won more men’s Ironman World Championships (20) than any other country. What 1956 Olympic host country has won the second most at 7? All signs are pointing to continued growth in the Casual Running community. Australia. We thought you might want a hint, and hope we didn’t make it too easy with our hint (Melbourne, Australia hosted the 1956 Summer Olympics, Sydney hosted the 2000 Summer Games but Nick thought including it in the clue would be a little TOO easy, again, send your emails to him). Rounding out the top 5, German athletes have won 5 championships and athletes from Belgium and Canada have each won 3. On the women’s side, American athletes have claimed 10 titles, followed by Switzerland (6), the United Kingdom (5), Canada (5), Zimbabwe (5), Australia (4), and New Zealand (2). 5) According to Running USA’s 2014 State of the Sport Report, how many days a year (minimum) must someone participate in running/jogging, according to the National Sporting Goods Association (NSGA) to qualify in its stats for the “total participation” in running and jogging? 6. Yup, only 6. We were a little surprised by this as well, as we know some Casual Runners have trouble forcing themselves to take rest days during the week! It is true though, once you get hooked on Casual Running, you are hooked. Remember, however, while everyone gets to define Casual Running in their own way, we would strongly encourage you to run or jog more than 6 times prior to entering your first race. Now that is a lot of shoes. 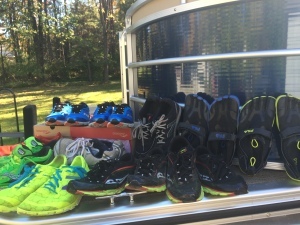 6) Sticking with Running USA’s 2014 State of the Sport Report, in U.S. dollars, what was the total amount of running shoes sold in 2014? $3.09 billion. Let us repeat that. $3.09 billion. Yes, Billion, as in with a “B.” That is a lot of cash. This resulted from sales of 46.25 million “units,” whatever that is…we are still too busy thinking about $3.09 billion. Just think how many miles were logged to burn through that many running shoes. Also, if you are anxious to add to that number, you can check out the Casual Runner Team’s growing collection of product reviews, just click here. 7) According to Running USA, in 2014, slightly more than half (57%) of all running event finishers were women. This is a great change in less than a generation. By comparison, in 1990, what percentage of running event finishers were women? 25%. What a remarkable increase in participation by women runners! Seeing these numbers and how they’ve dramatically improved in such a short time is a real testament to the growth and evolution of running as a sport. 8) Running is always more fun with a running buddy. 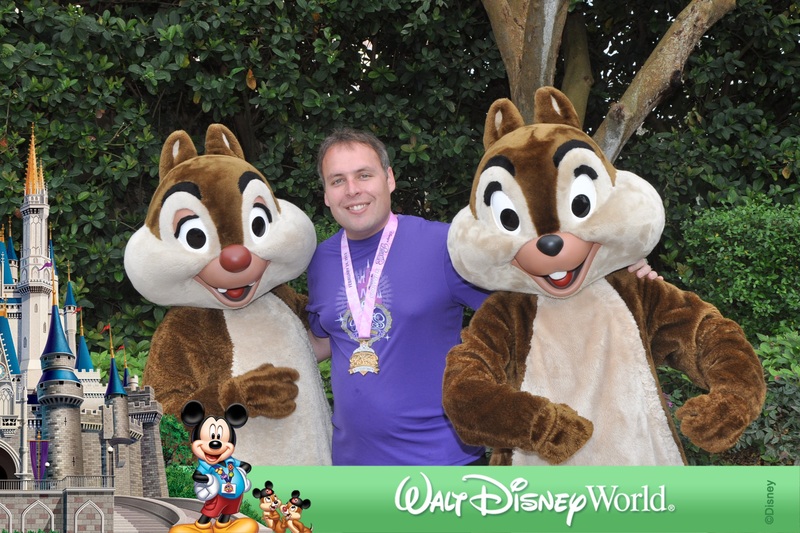 runDisney previously held a (now-discontinued) 2-person marathon relay, which was hosted by two mischievous buddies. Who were the host mascots for this event? OK, honestly: who wouldn’t want to run a race with these guys as your running buddies? Chip and Dale. You had to think about this one a little bit, but once you saw the answer, it made a lot of sense, didn’t it? 9) How many race weekends are there currently on the runDisney calendar each year? 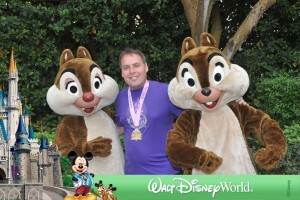 8. runDisney currently has 8 separate race weekends on its calendar, spread amongst 3 resorts on 2 different continents. 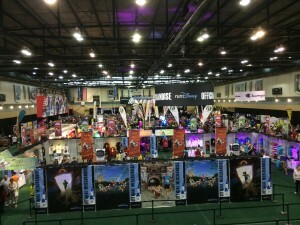 They are The Walt Disney World Resort (Marathon Weekend, Princess Half Marathon Weekend, and Wine and Dine Half Marathon Weekend), The Disneyland Resort (Star Wars Half Marathon Weekend, Tinkerbell Half Marathon Weekend, Disneyland Half Marathon Weekend, and Avengers Half Marathon Weekend), and Disneyland Paris Resort (Disneyland Paris Half Marathon weekend, debuting in September 2016). The calendar is always subject to change and additions, as runDisney retired (temporarily or permanently?) the Tower of Terror 10 Miler and the Everest Challenge events. So, stay tuned and we will keep you informed of any changes to runDisney’s magical offering of race events. 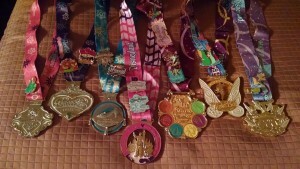 10) How many race challenges does runDisney currently offer? Race challenges are so much more appealing when you know you get to take home this sweet sweet bling. – Debuting in 2016, the Castle to Château Race Challenge, which requires runners to complete half marathons at the Disneyland Paris Resort and, your choice of either Walt Disney World or Disneyland Resort, in the same calendar year. So start brushing up on your French now! That is going to do it for our latest Casual Runner Trivia Challenge. How did you do? Share your results with your fellow Casual Runners using Facebook, Twitter, or Instagram. If you missed out, you can still test your skills at our earlier Trivial Challenge and the runDisney Everest Challenge clues.